The rare (critically endangered) and ornate ‘Ākohekohe, or Crested Honeycreeper, is closely related to the much more common ‘Apapane. It is one of the largest honeycreepers, measuring over 7 inches, and also one of the most distinctive. 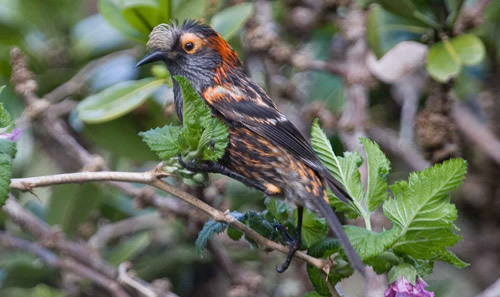 ‘Ākohekohe are uniformly dark with silver flecks on face and upper breast, white-tipped tails and wingtips, and have bright orange napes and eye patches. The white crest on their foreheads is the source of their English name. ‘Ākohekohe fiercely defend nectar sources and are often seen chasing other birds out of ‘ōhi‘a trees. With their exceptionally long legs they typically run across the tree tops between blossoms and are seen doing very acrobatic twists and splits to reach flowers. Unlike its cousin the ‘Apapane, ‘Ākohekohe only exist in pristine native forests above 5,000 ft in elevation making them the most range-restricted species on Maui. In 2013, graduate student Alex Wang (UH– Hilo) began a research project with MFBRP to investigate the dispersal distance and direction (elevation) of juvenile ‘Ākohekohe. Crested Honeycreeper or ‘Ākohekohe? The Hawaiian name ‘Ākohekohe most likely originated from a variation of it’s low glutteral song, “AH-kohay-kohay”. The most common song is an upslurred two-note whistle. Other calls are similar in tone and quality but highly variable in style. These include the low, guttural, “peter-peter gluk gluk” and “AH-kohay-kohay”. Mostly nectarivorous, ‘Ākohekohe forage almost exclusively on ʻōhiʻa lehua blossoms in the forest canopy. Occasionally they can be seen picking insects and other arthropods from branches. They also sometimes visit the flowers and fruits of other native plants. ‘Ākohekohe were once found on much of Maui and Moloka’i but are now restricted to an area of about < 25 square kilometers on Haleakalā volcano. Residing above 5,000 ft in elevation, fewer than 2,400 individuals may remain. Their range has shrunk more than any other Maui honeycreeper and they may still be losing ground. ‘Ākohekohe are listed as endangered by the U.S. Fish and Wildlife Service. The already shrinking range of the ‘Ākohekohe continues to be threatened by invasive and introduced plants and animals, and by upslope movement of avian malaria in response to climate change. It is important to understand how ‘Ākohekohe are affected by these threats and to recover additional populations.